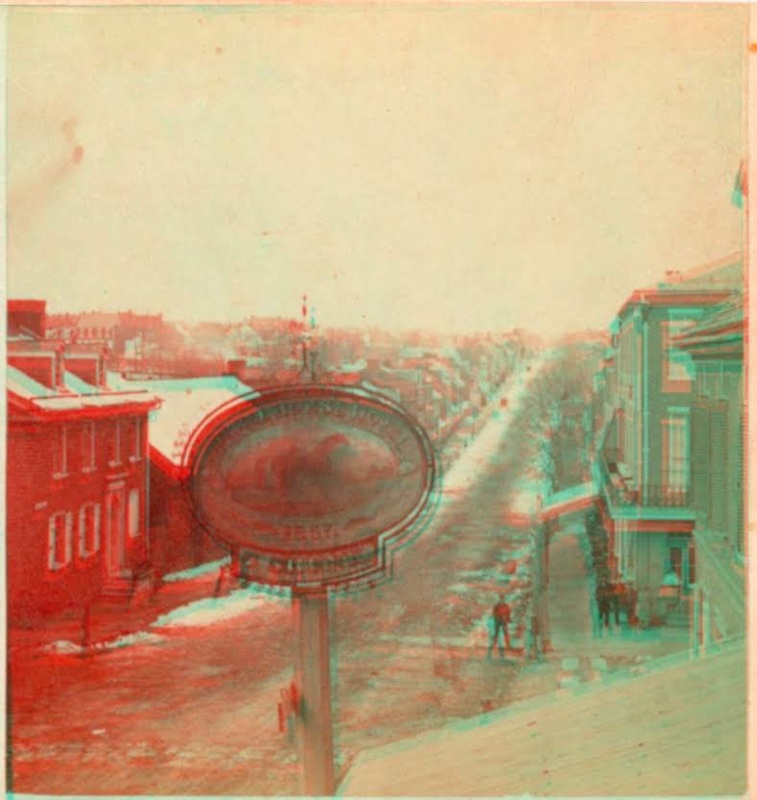 Stereoview of West King Street. Likely by B. Frank Saylor in 1866 or 1867. Sold on Ebay in 2018. A few months ago an intriguing photograph of a Lancaster street scene sold on Ebay. 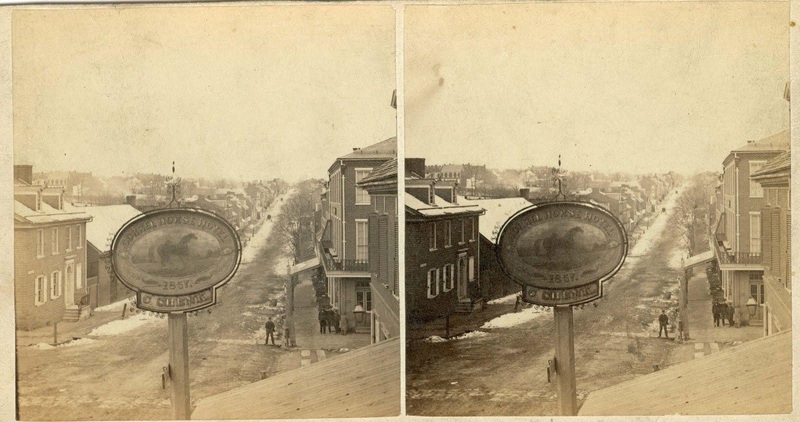 The photo shows West King Street from a vantage point above street level. In the foreground appears a sign for the Sorrel Horse Hotel with a date of "1857" and "C. Shenk" appearing on the sign. The image shows the intersection of Prince Street and King Street, and looks west along W. King Street going out of town. Snow appears on the rooftops and on the side of the streets. Benjamin Franklin Saylor was born Feb. 24, 1838, and was educated in the public schools of Montgomery county, and left Trappe for Philadelphia when he was twelve years old. In 1858 he became a student of photography at Ninth and Spring Garden streets. In 1865 he came to Lancaster to take charge of the late Charles Eberman's gallery, which he later purchased. This gallery was on the north side of West King street, and in 1882 he bought the building where his residence and gallery are now found on the south side of the same street. It is one of the fine buildings of the block, and contains two stores besides the gallery and the residence. I believe Eberman's photographic gallery was located approximately where the stereoview was taken. 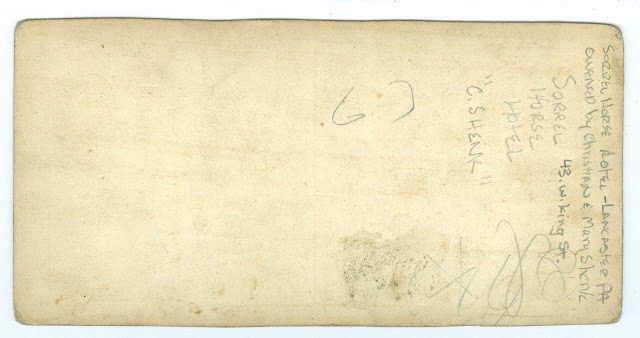 His carte de visite backmarks list his address at "No. 26 W. King St.," although that address currently corresponds to the Pressroom Restaurant/Steinman Hardware store. Could the numbering system for street addresses have changed sometime around the 1870s? If so, that would explain why the entry above mentions the photo studio as on the north side of the West King Street (whereas the modern No. 26 is on the south side of the street). Later photographs by Frank Saylor have an address listed of 45 West King St., and the 1886 Sanborn maps show a photo studio still at that location. Besides the circumstantial evidence of the location, I also believe that Frank Saylor made stereoviews with this style of mounting in 1866. There is a pair of CDVs of the interior of Holy Trinity Lutheran Church during a June 1866 celebration event with a Charles Eberman backmark (although he had died in April 1866), and there is a stereoview of Holy Trinity of that same event which I presume to have been made by Frank Saylor. Saylor's biography notes that he was involved with Lutheran churches -- particularly their choirs -- in the city, and he even married the daughter of Pastor Emanuel Greenwald (a poignant and tragic story, as she was known to be terminally ill when they married). Anyway, enjoy this look at a Civil War era street scene from Lancaster! The depth of the 3D is great if you have a chance to look at the anaglyph below or can view the original stereoview with a VR headset, and the animated gif below can give a partial sense of the 3D. Hopefully future posts can look into the magnificent series of William L. Gill stereoviews showing other street scenes from Lancaster. Wow, great stereoview. Would love to have had that one! Thanks for the post. Love the stereoview! Would have been nice to add to my collection!